U.S. Treasury Secretary Henry Paulson said Friday that China has pledged greater exchange rate flexibility but gave no timetable as the two sides wrapped up high-level talks aimed at strengthening shaky relations. Chinese Finance Minister Jin Renqing told the same briefing that the Chinese government will allow the Nasdaq market and New York Stock Exchange to open formal business offices in China. Jin did not give a timetable for opening the offices or any other details. Dozens of Chinese companies have listed shares on Nasdaq and the New York Stock Exchange, and both are eager for business as China's economy booms. The Nasdaq Stock Market Inc. has a representative office in Beijing but that status restricts the scope of its activities, barring companies from doing such things as signing contracts. The parent of the New York Stock Exchange is the NYSE Group Inc. The American and Chinese delegations at the talks in Beijing Friday announced agreements to cooperate more closely to promote trade, open markets, protect the environment and develop cleaner energy sources. But they gave no indication of commitments that might mollify U.S. critics who wanted Paulson to take a hard line with Beijing on its currency, which they say is putting American companies at a disadvantage because it is unfairly undervalued. "We each will take measures to address global imbalances through greater national savings in the United States and to increase consumption and exchange rate flexibility in China," Paulson said. 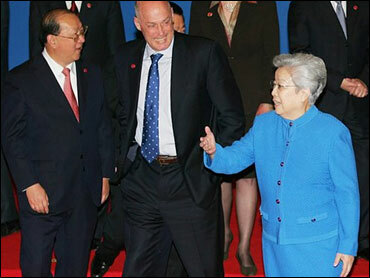 Paulson was speaking at briefing with his counterpart, Chinese Vice Premier Wu Yi, who described the two-day discussions as useful and productive, but did not comment on the currency dispute. "This dialogue has helped both of us to build mutual understanding and enhance trust," she said, adding a number of differences remained. "That such differences remain is understandable because the actual situations of China and the United States are completely different," Wu said. The talks at the Great Hall of the People in central Beijing were billed as a long-range "strategic economic dialogue." They were launched by President Bush and Chinese President Hu Jintao in September as a way for the countries to boost their economic ties. The second round will be held in Washington in May. Wu said Beijing hopes the exchanges will help clear up U.S. misunderstandings about China. China's mounting trade surpluses with the United States have fueled complaints by American manufacturers that Beijing keeps the Chinese yuan undervalued, giving its exporters an unfair price advantage. In a speech Friday in Beijing, Federal Reserve Chairman Ben Bernanke said that if China made its currency more flexible, it would improve the standard of the living of the Chinese people and foster economic stability around the world. Bernanke, who was part of Paulson's delegation, said it was in China's best interest to move ahead on economic reforms and let the yuan rise in value against the dollar. The move toward a more market-driven currency system will "enhance China's future growth and stability," Bernanke said in prepared remarks to the Chinese Academy of Social Sciences. The United States says its November trade gap with China swelled to $24.4 billion. It is on track to hit $229 billion this year, above last year's record $202 billion level. The export surge has nudged up the yuan, which on Thursday was allowed to rise to its highest level since Beijing began easing controls in July 2005, partly in response to American prodding. Chinese stock markets also rose to a five-year high Thursday. Paulson has tried to downplay expectations of breakthroughs in this week's talks, describing them as the start of a long-term discussion, but the high-profile of the U.S. delegation had raised expectations. Besides Bernanke, Paulson's delegation also included Energy Secretary Samuel Bodman, Commerce Secretary Carlos Gutierrez, U.S. Trade Representative Susan Schwab and Health and Human Services Secretary Mike Leavitt, as well as the head of the Environmental Protection Agency.